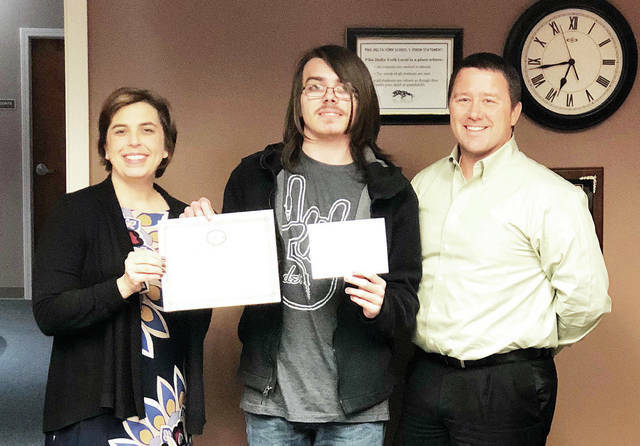 Parker Tilse, center, a senior at Delta High School, has been named a Commended Student in the 2019 National Merit Scholarship Program. A letter of commendation from the school and the NMSC was presented to Tilse by Principal Kristie Reighard. He is among 34,000 Commended Students through the nation being recognized for their academic promise. Also pictured is Mike Ford, president of the Pike-Delta-York Board of Education. https://www.fcnews.org/wp-content/uploads/sites/45/2018/10/web1_PSAT-National-Merit-Award.jpgParker Tilse, center, a senior at Delta High School, has been named a Commended Student in the 2019 National Merit Scholarship Program. A letter of commendation from the school and the NMSC was presented to Tilse by Principal Kristie Reighard. He is among 34,000 Commended Students through the nation being recognized for their academic promise. Also pictured is Mike Ford, president of the Pike-Delta-York Board of Education.